Benedictine monks at the monastery of St. Giustina in Padua used this book to recite the Divine Office. 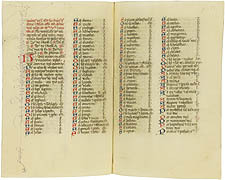 The pages on display present the litany of the saints. Obtained before 1878 by A.D. White. Breviary. Italy (Padua), middle of the 15th century.